Besides the joyfulness of discovering a new culture, capturing photos and tasting exotic flavors of Vietnam, shopping might bring you more opportunities to get in touch with locals habits. A shopping journey is usually the last step of a trip and it is always tricky. Hence, last month, the event named “HCMC 100 exciting things” announced the top 5 souvenirs to gift friends, family members and beloved ones. The result came from a poll voted by travelers and expats. It aims not only to help promoting HCMC but also to drop useful hints for tourists. Non la (leaf hat) have a perfect right circular cone made of bamboo cataphyll and are notable for their romantic and timelessly crafted adornments. More than an indispensable tools for people in Vietnam, it became a symbol. Their styles differ by regions as Tay group has distinctively red color, Thanh Hoa has only 20-hem frame, Hue’s is thin and elegant while Binh Dinh’s is thick. Those conycal hats are at any time of the year; Its shape protects from the rain as an unmbrella during the rainy season and also protect from the sun and heat when temperature reaches umberable numbers. This hat is the distinctive sign of people coming back from Vietnam in Airports around the world. Local Insight: At the workshop, you can get a hat for only VND 3,500- VND 10,000. Depending on the quality, the price range is between VND 30,000 and VND100, 000. Since 18th century, Ao dai is a Vietnamese national costume associated with Non la to enhance the gracefulness of a lady. After several changes in design, there are 3 main styles of ao dai nowadays. For example, “trendy” ao dai reach to the floor and fit the curves of the body by using darts and nipped-in waist, Ao dai hippy is brightly colored and very popular among young teenagers and Ao dai mini have slits extended above the waist and panels reach only to the knee. Local Insight: Ao dai costs at least VND700,000 for a plain finished product. If you can spend time and have experience in looking for good cloth and tailor, you might have your stylish ao dai with reasonable price below VND 1,500,000. Silk is finished-product made of cocoon of the silkworm. Thus, It has always been considered extremely luxury and only available to the nobility. The days when silk had only been served for Vietnamese royalty was long gone, it has become widely used throughout the country. In turn, the price is affordable now. Therefore, tourists have more chance to choose their favorite silk products and make them as lustrous presents. What is special is that the silk is made by very simple looms, which is the genuinely traditional Vietnamese way of making silk. Local Insight: The price for regular Vietnam silk is at least VND 70,000/m and over VND100,000/m for premium kind. For silk below that price is originating from China and quality is questionable. Talking about hand embroidery, tourist will instantly imagine of sitting pretty lady, patiently threading every single line to create an artistic handkerchief. It is the art or handicraft of decorating fabric or other materials with designs stitched in strands of thread or yarn using a needle. Tourist can give personalised presents to family and friends by explaining idea to the artist. Local Insight: Tourist can have a nice small hand embroidery product for around VND500,000. With bigger picture, price can be more than VND2,000,000. Sandpainting is the art of pouring colored sands, powdered pigments from minerals or crystals, and pigments from other natural or synthetic sources onto a surface to make lively picture. Vietnamese sand picture comprises of 4 categories such as landscape, portrait, laborer and calligraphy. Local Insight: Price range is from VND300,000 to VND700,000. Outside of the list, City Pass also found these 2 souvenirs among tourist’s decisions for gifting. Wooden clogs (guoc moc) are a sort of traditional footwear for both female and male long time ago. 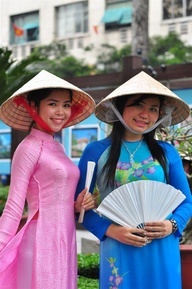 After the feudal period, they mostly remained in a trio of Non la, Ao dai and Guoc moc to increase the gratefulness of Vietnamese ladies when attending important festivals or any special events in town. Thought they seldom have been used in the modern life, tourist can catch them at some traditional activities like Cai Luong and Ca Tru performance. Local Insight: Being considered as old fashioned footwear, the real Vietnam wooden clops are hard to find. If you can find it around VND150,000 then go for it. A handmade musical instrument can also make a nice memento. Bamboo flute and mini T’rung are very popular. Since flute is just a small bamboo pipe and T’rung is knockdownable instrument, tourist can find it convenient to carry home and easy to assemble. Their sweet tone should thrill your ears and remind you the memorable moments in Vietnam. Local Insight: Price range is from VND300,000 to VND1,000,000. You should expect to bargain hard for the items you want. One of a trick can be applied in Ben Thanh Market is to cruise the fixed-price shops outside and negotiate with the inside shops for the items you want to buy. We will have a blog post on Bargaining at The Market which shows you some tips to bargain and suggest some best places for shopping outside of the Top 10 Shopping Places in the HCMC 100 exciting things post.